This print commemorates a performance of Ōishizuri Sakura Tanzaku at the Naka Theater in Osaka in the 3rd month of 1822. Osaka Prints tells us a bit about this play, which is quite a feat considering how little we know of it. This play and production was a big hit and proved to be a popular subject for a number of artists. 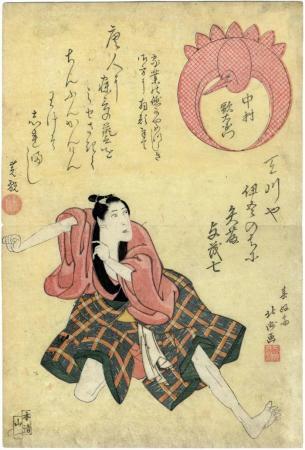 Although the plot for Ôishizuri sakura tanzaku (Ôishi’s stone rubbing, a poem card, and flowering cherry: 大西摺桜花短冊) remains unknown, some role names (such as the virtuous wives Oishi and Osono, or Okaru's brother, Teraoka Heiemon) inscribed on prints by several artists for this production suggest that the story line was adapted from the most famous of all revenge plays, Kanadehon chûshingura (Copybook of the Treasury of Loyal Retainers: 假名手本忠臣蔵). Prints by Hokushû, Shunchô, and Yoshikuni for this performance further identify Utaemon's role of the wine-shop merchant (天川や) as Amakawaya Igo (later called Yatô Yomoshichi). Utaemon also performed as Tashirô Yasubei (a.k.a. the servant Yasuke). There are two versions of this performance in the Lyon Collection. The other one is by Yoshikuni. Schwaab wrote: "This Hokushū version, published by Honsei, has the added luster of the crane-form cartouche symbolizing Utaemon and a poem signed by the actor himself with an elaborate seal." Illustrated in Ikeda Bunko, Kamigata yakusha-e shūsei, vol. 1, 1997, #123. And in Dean J. Schwaab's Osaka Prints, p. 88, #49.